Dr. Scott Sampson tells what it's like to discover dinosaur fossils in a national monument that Trump is trying to gut. Paleontologist Scott Sampson poses with his favorite dinosaur, the 15-horned Kosmoceratops richardsoni, which was discovered in Grand Staircase National Monument. When paleontologist Scott Sampson enters Grand Staircase-Escalante National Monument in Utah, he is time-travelling back to the Age of Dinosaurs. He shares with readers what could be lost if courts allow President Trump’s gutting of the monument to stand. 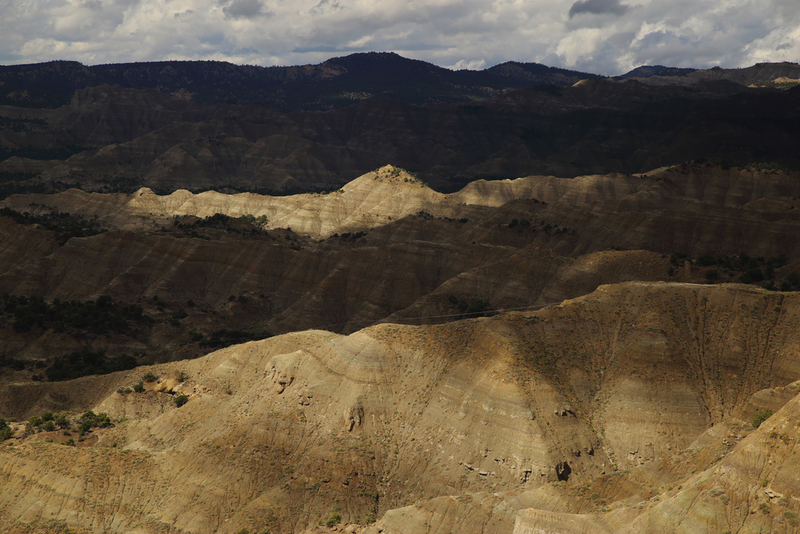 What led you to paleontology and to your work in Grand Staircase-Escalante? Like most kids, I had a huge passion for dinosaurs at age 4. Unlike most kids, I maintained that passion into adulthood. Some people have told me I just never grew up. We are coming into a heyday of dinosaur paleontology. Up till now, much of dinosaur research has been akin to stamp collecting—discovering new species and giving them names. Today we have enough data, and tools afforded by new technologies, to ask and answer questions that were previously inaccessible. What was the world of dinosaurs actually like? How did Mesozoic ecosystems with dinosaurs actually work? How did they evolve over time and in what ways were they similar and different from modern ecosystems? Grand Staircase-Escalante National Monument represents arguably the last great unexplored dinosaur boneyard in the United States. And it is one of the most critical windows anywhere in the world to begin to answer questions like these. 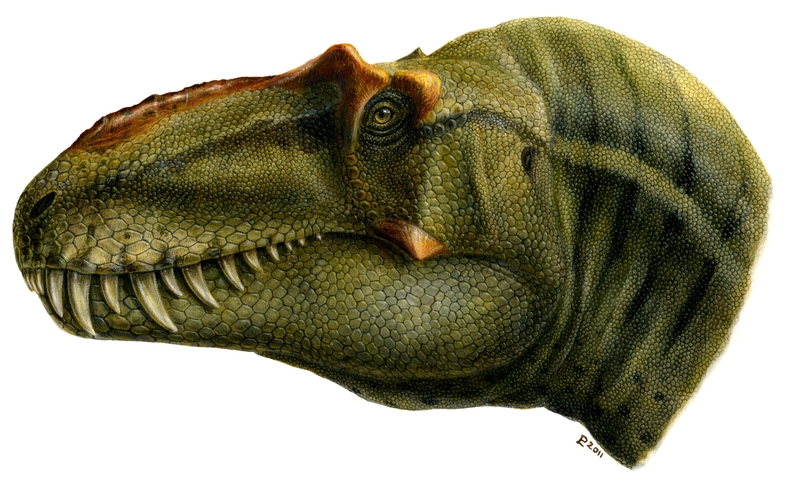 The huge carnivorous dinosaur Lythronax argestes, whose name translates to "Gore King of the Southwest," was first unearthed in Grand Staircase-Escalante in 2013. 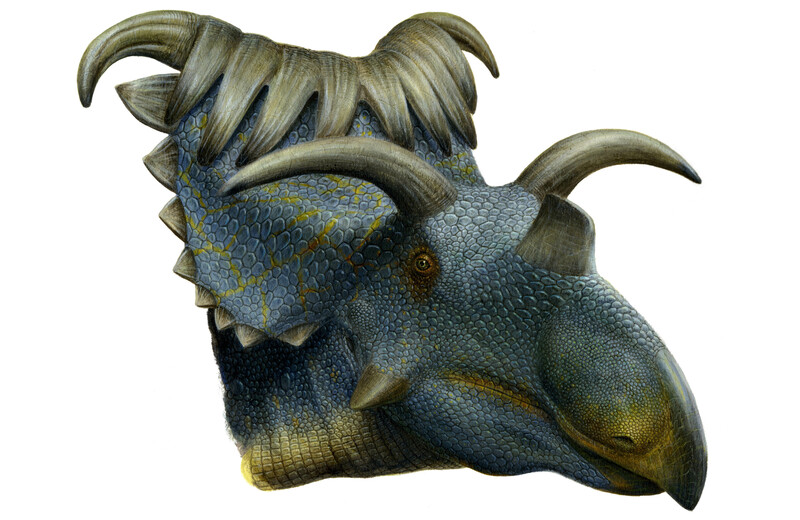 Fossils of Kosmoceratops, which has the most ornate skull of any known dinosaur, have been found in the Kaiparowits Formation in the Grand Staircase-Escalante National Monument. Teratophoneus curriei, a 12-foot-tall tyrannosaur that died 75 million years ago, was discovered in Grand Staircase in 2011. A high school student discovered the fossil of a juvenile Parasaurolophus, depicted here, in Grand Staircase in 2013. What is it like to hunt for fossils in the monument? There are many places in the Monument, particularly on the Kaiparowits Plateau, where it’s tough to walk for 15 minutes without finding a fossil – they are that abundant. When you discover a dinosaur fossil, you rarely come across an exposed skull with teeth gleaming on the side of a hill. What you typically find are bone fragments; you have to follow those fragments and try to find the spot on the hillside where they are eroding from. Once you find that spot, you dig in. And if you’re lucky, you find more fossils. One day while I was out on my own in the northern part of the monument, I came across fossilized fragments of backbone that I immediately recognized as belonging to a giant duckbilled dinosaur. Over the course of a few hours, alone in that exquisite badlands setting, I removed enough rock to show that virtually the entire backbone was present, together with abundant skin impressions. I knew that this was the first time in 76 million years that the remains of this ancient, 30-foot long plant-eater had been exposed to the light of day, and that I was the first human to see these fossils. It felt like I had a direct connection to the Mesozoic Era. For a paleontologist, it just doesn’t get much better than that. A moonlit arch rises over Grand Staircase-Escalante, a national monument under threat from the Trump administration. Why is understanding the Mesozoic Era important? Although our modern climate is warming rapidly, we still live in an ice age. So if you want to understand how life on Earth reacts in a period of intense global warming, you have to seek out ancient, “greenhouse” ecosystems like those preserved in the rocks of Grand Staircase-Escalante National Monument. Why exactly is the monument so special if dinosaurs roamed all over the earth? Dinosaurs lived on every continent on Earth including Antarctica, but they are preserved and exposed in relatively few places. In North America, dinosaur remains are found predominantly in the West, where geologic forces have pushed fossil-bearing rocks to the surface. Grand Staircase received its name from the stair-step arrangement of variously colored rocks, which preserve evidence from the full span of the Mesozoic Era—the Age of Dinosaurs. Now, many places simply don’t preserve fossils very well. In contrast, the preservation in Grand Staircase is staggering. Fossils of dinosaur skin are extremely rare. Yet about half of the duckbilled dinosaur skeletons found in the monument included skin impressions. The vast majority of the dinosaurs we are finding in Grand Staircase are found nowhere else on earth. So the monument is unique; it is not a window into the past that could be opened anywhere else. How would the Trump administration’s plans for the monument impact the scientific work there? The Kaiparowits Plateau in Utah, part of the Grand Staircase-Escalante National Monument, is known for its coal deposits and dinosaur fossils. People will say, “Well, it’s still protected.” But the protections will certainly be diminished, including less policing of people who might be poaching fossils. The land will also become “multi-use,” subject to more grazing and to mining. If there’s a conflict of use between paleontology and mining, it seems highly likely that paleontology will lose out without the monument protections. I’m not aware of any place in the world where coal mining and fossil hunting exist in harmony side by side. On a happier note, you also host a television show for kids about dinosaurs. Why do you think kids are fascinated with these creatures? 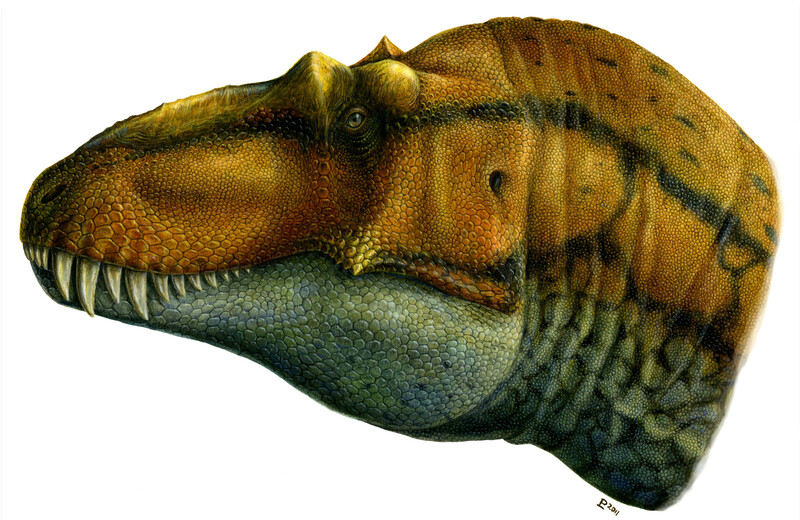 Dinosaurs are bizarre-looking, giant monsters that we no longer need to worry about. What could be more intriguing to a kid? Paleontology also represents the first opportunity for many kids to know things their parents don’t know. In my role as Dr. Scott the Paleontologist of Dinosaur Train, I’ve spoken to thousands of kids. They are more than happy to tell you dozens of multisyllabic names of dinosaurs together with the geologic time period that they lived. It’s always fun to watch parents’ jaws just drop as their kids share this newfound expertise. Importantly, dinosaurs often become a child’s first foray into science, so they are also powerful in that regard. We have taken kids from small southern Utah communities out to Grand Staircase, and they’ve had a chance to see fossils coming out of the ground in the place where they live. We’ve also done distance learning, with me or some other paleontologist standing before a camera, sharing new discoveries with kids all over the U.S. in real time—a powerful way to see science in action. 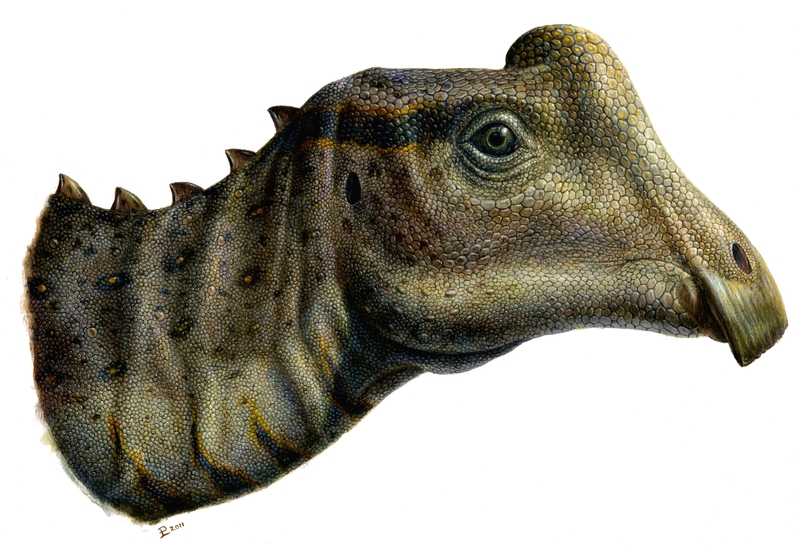 What’s one of the most interesting dinosaur questions you’ve received from a child? Too often we underestimate the intellectual capabilities of children and try to “dumb down” science. But they never fail to blow me away about with their smarts. I’ve had 4-year-olds come up to me and say, “Dr. Scott, I have a hypothesis about why the dinosaurs went extinct.” And that 4-year-old then goes on to show that they know what that word means. Amazing. Back to the world of adults: How did you personally feel when you heard about Trump’s plans to gut the monument? Sad. Sad that we don’t recognize the value of places like Grand Staircase. Sad that we haven’t been able to do more to highlight the monument’s scientific importance, and its potential to foster a deep sense of wonder. And sad that the reason that this is happening relates in part to the mining of fossil fuels. It’s hard not to see the irony of limiting access to one kind of fossil resources so that we can exploit another. Take Action! Tell Congress to defend our national monuments and oppose bills that attack our iconic public lands! Tell Congress to defend our national monuments and oppose bills that attack our iconic public lands.